Once your toddler is six months old, it is fun to see them enjoy solid foods. But as a parent, you must take utmost care to give your baby only nutrient-rich foods as infants and young children tend to have weaker immune systems than adults, which may cause food poisoning in this age group. 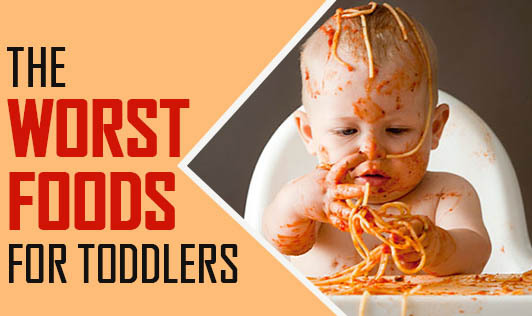 Here is a list of foods that are better to avoid for your little one. Honey, until after the baby's first birthday because it can harbor spores of toxic bacterium that can cause botulism. Small, firm foods: including popcorn, dry flake cereal, seeds, nuts, chips, and chunks of raw vegetables, whole cherry tomatoes and whole olives. Sticky foods: chunky peanut butter, gummy candies, jelly beans, gum, caramels, dried fruits. Slippery foods: including large pieces of meat and poultry, whole small fruits, such as grapes, berries and cherries and hard candy such as lollipops.